All of Frontier Group’s staff commute to work primarily by walking, biking or running. The following stories of how we adopted our commutes illustrate some of the challenges of starting, and the joys of continuing this habit. 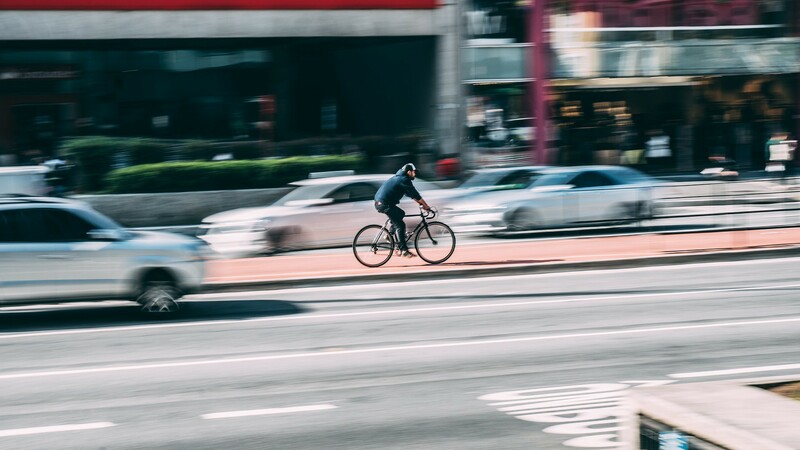 These stories also highlight the choices our cities and towns need to make to tackle transportation’s contribution to global warming, and to make our communities happier, healthier places to live by allowing everyone to commute sustainably. As the newest member of Frontier Group, it’s impossible not to be inspired by how committed all of my colleagues are to commuting to work in a responsible and clean way. I am also lucky enough to live less than 10,000 feet from my office, so there is no excuse not to follow their example. Unfortunately, I have never been a very strong bicyclist, only half-learning in college after saying I already knew how to ride for a theater audition (I did not get the part). Every few months since graduating I would summon the courage to try again and ride my bike, whether I was in New York City, San Francisco, or Addis Ababa. White-knuckled and sweaty, I would arrive at my destination, kiss the ground beneath me, and the bicycle would return to its storage space. I do, however, love to run. I have been on track teams, cross country teams, and completed marathons, amazed at the distance I could travel on just my feet. I love to fire up podcasts or my favorite Broadway soundtracks and feel the miles disappear beneath me, always a little slower than I would like. I wouldn’t quite say that I ever catch a “runner’s high,” but rather I appreciate the momentary discomfort knowing that it is beneficial to my body and my mind, as well as the environment. Any aches and pains are a small price to pay. My resolution this year is to become a more competent bicyclist. On weekends, I will walk my bike to the park and eavesdrop on parents teaching their children how to stop and turn — admittedly my two biggest weaknesses. And maybe this time, with my new coworkers for inspiration, it will click. I remember when I started bike commuting. It was 2010, but I don’t recall precisely why I started. Curiosity, I guess. It just seemed like a thing I should try. The problem was, I didn’t have a bike. The last time I had ridden semi-consistently was in high school, when a few bad experiences with cars on the mean streets of Pittsburgh made me stash my two-wheeler for good. So, I resorted to hauling my wife’s way-too-small, 1980s-vintage tank of a bike out of the garage for those first few commutes. The bigger question is why I kept bike commuting. Initially, as I wrote about here in 2012, it was the redo of a hellaciously dangerous intersection in Boston that made me feel comfortable taking a more direct route to work. That made biking faster than taking the MBTA—and more flexible, too. As I’ve ridden more, I’ve come to learn that there is no way in which bike commuting is not good for me — it gets me to work energized, helps keep me fit, is fun, and helps me see and understand my city in a new way. It’s changed me and my worldview, which is not something I could say happened during the periods of my life when I commuted by car. 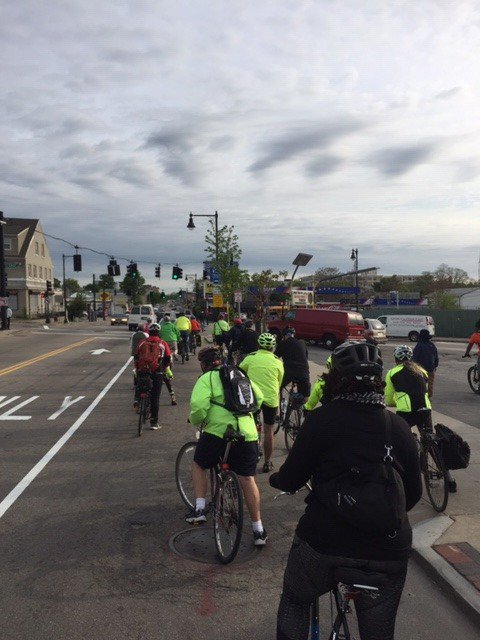 Bike to work day in Dorchester, Massachusetts. Photo by Tony Dutzik. I grew up in the depths of suburbia outside Minneapolis, where having two cars was a household minimum. My neighborhood came alive at 5 a.m. every weekday, as people scrambled to beat the morning traffic. Both my parents drove to work every day, and had resigned themselves to an hour and a half of bad radio talk shows and freeway scenery. Minus the beard, nice clothes and “hipness,” I have achieved my goals. I am fortunate enough to live 18 minutes away from work by bicycle, which is roughly equivalent to what it would take to drive. Plus, I save time not having to look for a parking spot. And, as parking costs $15–20 a day in downtown Denver, I save a lot of money. Biking as a commuter has also allowed me to “get into” biking. I just bought a beautiful, bright blue Nishiki road bike from the 1970s, and am in the process of fixing it up. The whole experience has given me a new hobby and a chance to exercise my brain in an entirely new way. Most days I ride my bike to work. I get to ride over a bicycle and pedestrian bridge that crosses I-25, the highway that cuts through Denver. The freeway is usually packed with cars. I can smell the exhaust fumes as I ride over and the sound of the traffic is really loud. Every morning I’m so thankful that I’m on my bike, instead of stuck in a car on that freeway. I get to ride past parents pushing strollers, people going on a run, people walking their dogs. After that bridge, I cross a river and ride through a park into downtown. I’m happier getting some exercise and fresh air to start my day. It also makes me feel closer to my community — I see new stores open, I read happy hour offerings on signs in front of restaurants, I notice new art installations. If it’s very cold out, I’ll take the bus, or if I don’t want to have my bike with me after work, I’ll use a shared bicycle or electric scooter. These new shared mobility options are convenient and affordable. I wish more people could live in places that enabled them to have a relaxing—or even fun—commute. By dedicating some street space to buses and people, communities can help give people that option. I grew up in a single-car household. Both my parents commuted to work via bike. Rain or shine, I rode my bike to school—or walked, even if I had to carry my violin case in its special waterproof outer case. We also had a covered bike trailer that we sometimes used for hauling things. The only time my parents thought it was acceptable to use the car was if you were going to be carrying tons of stuff (a week’s worth of groceries), had multiple people in the car, or were going too far (more than a 25 minute ride, probably). That initial experience gave me a strong bias toward walking and biking. In college, I had several different summer internships and jobs, from which I learned not only what kind of work I wanted to do, but how I preferred to get there. One summer, I biked to work. That was great. Another summer I had a 45-minute drive, which I did with a carpool group. It was awful — I arrived at work sleepy and lethargic, and it took so much time. A third summer I commuted to work via bus and bike. I used the hour-long ride as an opportunity to read or do work, and then I biked home, which often was faster than the evening bus and followed a scenic route. Since then, I’ve always lived within biking or walking or bus distance from work. For years, my husband and I owned just one car. He often needed the car for work, so I commuted in other ways as needed. We calculated that I could spend up to $7,000 a year on cab fares and it would still be cheaper than buying another car. Unfortunately, after we had a child and moved to a less walkable and bikeable city, we purchased a second car. But after unhappily driving our son to preschool for two years, we chose his elementary school based in large part on the fact that we could bike there. Now, he arrives at school full of energy and I have the pleasure of a brisk ride back to my home office.